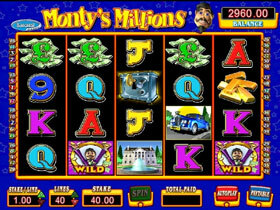 Monty's Millions – 5 Reel, 40 Payline Bonus Video slot from IGT. The game is based on the affluent lifestyle of the mega Rich and Famous. Features include Stacked Wilds, Jackpot , Free Spins Bonus and huge cash prizes. Gold Bars, Super Cars, Bank Notes, Mansion, Vault and the high value cards A, K, Q, J, 10, and 9. Play for free or for real money in denominations of 0.1 up to 10.0 per payline bet. 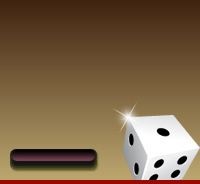 The minimum bet amount is 0.01, the maximum bet amount is 400.00 per spin. The biggest Jackpot in this game is 20 000 coins. The Wild symbol substitutes for all the other symbols to make up winning combinations. On each reel there are stacks of 4 or more wild symbols. The Wild symbol can line up to activate an enormous amount of simultaneous wins! The Monty Millions Wild doesn't substitute for the Vault Scatter symbol or the Free Spin Bonus Round. The Vault may be scattered anywhere on the reels to complete winning combinations, but 3 Vault scatter symbols must appear. Land 3 or more Scatter symbols on reels 2, 3, and 4 to win 5 Free Spins in the Bonus Round. During the Free Spins more stacked wilds and bonus symbols can appear. The Free Spins can be re-triggered up to 255 times in a single bonus round. Win 5 Free Spins in this Bonus round when a Vault symbol appears on the 2nd, 3rd and 5th reels. Additional Free Spins will be awarded when another 3 Vaults appear on the reels during the bonus. The music and graphics are both excellent, but you do have an option to turn the audio Off, and you can adjust the graphics quality to suit your computer. This game will make you yearn for that big win, so you too can indulge in the luxurious lifestyle depicted here….live in style, drive a fast car, buy whatever your heart desires ! With all the action offered on this game you could just win the cash prizes to enable this opulent way of life.